(Nanowerk Spotlight) The term biosensing relates to systems that include electronic, photonic, biologic, chemical and mechanical means for producing signals that can be used for the identification, monitoring or control of biological phenomena. The resulting biosensors are devices that employ biological components such as proteins to provide selectivity and/or amplification for the detection of biochemical materials for use in medical diagnostics, environmental analysis or chemical and biological warfare agent detection. Surface plasmon resonance (SPR) has become the technology of choice for label-free detection of proteins and other biomolecules. SPR is based on the excitation of a surface plasmon at the interface between a dielectric and a thin layer of metal, typically gold. Once the sample is covered with the nanostructured gold layer (or another suitable metal), the surface absorbs light at certain wavelength. The absorption maximum is influenced by the refractive index of the fluid at the gold surface. This effect is called localized surface plasmon resonance (LSPR) and it is used for detection of presence of biomolecules, such as specific proteins. Typical systems for LSPR use spectrometers – optical instruments used to measure properties of light over a specific portion of the electromagnetic spectrum. With advances in electronics and optics, spectrometers have become compact electronic devices that are easily plugged into a computer to perform the massive data processing that is required for analysis. Researchers in Singapore have now developed a palm-sized and battery-operated bio-detection system based on LSPR which can operate on a single chip processor. "Both SPR and LSPR systems were recently introduced in portable forms and these solutions are very elegant and space efficient" Dr. Pavel Neuzil tells Nanowerk. "However, the spectrum analyzers on which they rely require complex data processing performed by a PC. Further simplification of the LSPR system would require replacement of the spectrum analyzer with another device giving a straightforward electrical output, such as voltage." What Neuzil and his colleague Dr. Julien Reboud at the Institute of Microelectronics in Singapore developed is a way to measure the LSPR effect without a spectrum analyzer. Reporting their findings in the July 1, 2008 online edition of Analytical Chemistry ("Palm-Sized Biodetection System Based on Localized Surface Plasmon Resonance"), the two scientists' work resulted in a miniaturized system that does not require any external power supply or personal computer and it is therefore suitable for point-of-care and field applications. Neuzil explains that the typical reflection spectra of an in-house-fabricated LSPR chip exhibits absorption peaks at 555 nm for water and 645 nm for ethanol. "Measuring only the intensity of the reflected light at a few selected wavelengths could lead to a calculation of the peak shift" he says. "In fact, a LSPR system with high reproducibility could even be based on the amplitude of the reflected light intensity at a selected wavelength. The consequence of this is significant as this would allow replacement of the spectrum analyzer and subsequent signal processing scheme by a single source of monochromatic light and a photodiode as detector. The resulting photocurrent output could then be converted into a voltage by an operational amplifier with a resistor in a feedback loop (I/V converter) and detected by a voltmeter." Neuzil and Reboud found that the gold layer was not removed even though they tried different solvents. At that time they noticed that the nanostructured area of gold started to change color depending on the solvent it was soaked in. "This was interesting indeed and we started to investigate where the color change was originating from" says Neuzil. "At that point we also started to think about how to measure this effect without using fancy instrumentation." To be used as a biosensor, the gold surface is first covered by molecules that are antibody-specific to the target (antigen). Once the antigens are presented they bind to the surface and change the emission peak of the absorption. Conventionally, this peak location is determined by the reflection of white light from the surface and its spectrum detection is performed by a spectrometer. What Neuzil and Reboud have proposed and tested is a simple method to detect the shift of the absorption peak that originated from the sample. The reflected light originating from the multiple light sources, leading to one photocurrent output of a single detector, can be demultiplexed either by using sequential illumination and synchronized readout or by using a lock-in amplification technique. "We have upgraded a previously reported single-channel optical system based on a lock-in amplification technique ("An integrated fluorescence detection system for lab-on-a-chip applications") into a four-channel system capable of simultaneous detection of the intensity of the reflected light from four individual light sources" explains Neuzil. "Each light source was modulated at a different frequency, and the composite signal detected by the photodiode was demodulated to provide four outputs corresponding to four individual signals each related to one light source. The optical system was also redesigned to accommodate four 5-mm-diameter LEDs, mounted around a photodiode detector. As the reflected light intensity from the LSPR chips is much greater than the previously detected fluorescence, the new optical system requires lower efficiency. That was achieved by the longer optical path between LEDs and the photodiode as well as using less sensitive photodiode than earlier." After the demodulation and demultiplexing of the composite signal, the four output signals were converted into a digital format by A/D converters and displayed on the 4-in. LCD display. 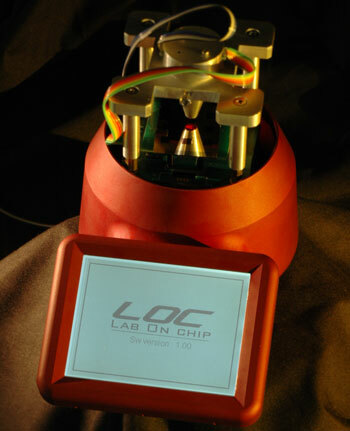 The data processing as well as the display was controlled by a single chip controller. The whole system is shown in the image above. This novel device is based on a platform of a universal lab-on-a-chip system which is being developed at their Institute of Microelectronics. The institute has been working on molecular diagnostic technologies and devices for some time (for instance see our news item "Bird flu testing on the cheap ") and the scientists have been reporting their findings in several papers recently such as ("Clockwork PCR Including Sample Preparation") in Angewandte Chemie and ("Disposable real-time microPCR device: lab-on-a-chip at a low cost") in Molecular BioSystems.